When Lisa grabbed a package of boneless chicken breasts out of the freezer this afternoon, she said, "Our freezer is so empty." She's right. It is. Aside from the packages of boneless chicken breasts, veggie burgers, Italian ice, and a few other odds and ends, it's rather empty. It's been that way during the months of July, August, and most of September since 2012. I remember the day our Summer Bare Freezer Fest began. It was the end of July of 2012. We had lived here for only a couple of weeks. Lisa and I went out to run a few errands. When we came back, there were a few huge, gorgeous sunflowers at our back door along with a couple of bags. The bags were filled with fresh garden produce from our neighbor friends who have become family. That year was one of the first years I had gone without having some sort of means to grow fresh produce. Needless to say, I was in awe and exceptionally grateful. I baked them homemade chocolate chip cookies to extend our gratitude. The bags of produce continued that year through September. Since then, as more neighbor friends have become family, they've shared their bounty of fresh grown fruits and vegetables throughout the Summer months. Raspberries. Blackberries. Blueberries. Summer squash. Zucchini. Butternut squash. Cucumbers. Lettuce. Green beans. Tomatoes. Corn. Beets. Radishes. Peppers. They've also shared the delicious treats made with their bounties. Jams. Relishes. Pickles. Muffins. Pies. I have done the same. This time of year, I bake a ton of zucchini bread, berry bread, crunch pies, and zucchini brownies all made with the produce they've shared with us. In return, I share those baked goods with them. It's like a neighborhood Farmers Market. I always feel a sense of nostalgia this time of year. This is the stuff we grew up on. My Grampy always had 2 large gardens. We had a rather large one as well. I remember spending a lot of time in the gardens during the Summer months weeding and picking. For dinner, we'd dine on tomato sandwiches and cucumbers with salt and pepper. To this day, tomato sandwiches are my absolute favorite. Cucumber sandwiches are another favorite. 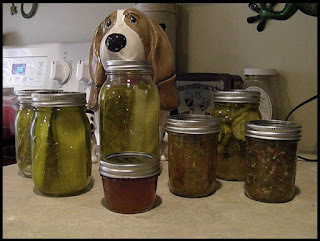 When my Great Aunt Ida was alive, she made an endless array of pickles, pickled vegetables, jams, relishes, and jellies. When I got older, I always had a garden whether it was in the yard or a porch of produce. As the season ended, I'd spend afternoons chopping vegetables to freeze. I still do that. During the Fall and Winter months, we use the frozen vegetables to make homemade soups, spaghetti sauces, and stews. Yes, we always reserve a few zucchinis to shred so we can enjoy and share homemade zucchini bread after the Summer months. When Lisa made the comment about our freezer being bare, I told her to open the fridge. It's stocked almost solid with fresh produce. We enjoy it all with our dinners. The kids love the fresh fruits and vegetables too. We incorporate the produce into their meals and snacks.